Who is the Bad Astronomer? Who is this guy who calls himself "The Bad Astronomer?" Is he really bad? Is he really an astronomer? First, yes, I am a real live astronomer (when people ask me what astronomers do, I tell them "They astronom!"). I'm also a writer, and in fact in mid-2007 I decided to write full-time about astronomy. I live in Boulder, Colorado, where I'm writing not only my blog, but also my second book, titled "Death from the Skies" about different ways astronomical events can wipe out life on Earth. It sounds grim, but... well, it is kinda grim, but I'm trying to make it a bit funny and be careful to stress that the odds of any of these events are pretty low. How many people do you know who have been killed by a gamma-ray burst? From 2000 to May 2007 I worked in what's called the Education and Public Outreach (or E/PO) field at the physics and astronomy department at Sonoma State University, a member of the California State University system. I worked on NASA-sponsored public outreach programs for several satellites, including GLAST (Gamma Ray Large Area Space Telescope), Swift and XMM-Newton. All three look at high-energy forms of light like gamma rays and X-rays. These are emitted by powerful objects like black holes, exploding stars, and super-dense neutrons stars. AT SSU we developed educational materials based on these missions. Since a lot of people assume I work or worked for NASA, I will add I am not, nor ever have been, a NASA employee, and anything I say, pretty much ever, is not the official word from NASA! I always speak for no one but myself. I spent many years as a research astronomer and programmer supporting other astronomers' work (and I still do this a bit now). In my last position, at NASA's Goddard Space Flight Center I worked on the Space Telescope Imaging Spectrograph (STIS). I help calibrate STIS, which means I analyzed test images taken by STIS and figured out how well it was working. I also did some actual science with STIS, which means I also got to analyze actual observations of astronomical objects. So far I have helped analyze the first ever brown dwarf discovered (a brown dwarf is an object that is too small to be a star but too big to be a planet), and also helped analyze images and spectra taken of a star that blew up in 1987, called Supernova 1987A (you can read my web page about that). I have also worked on data taken of asteroids, quasars, galaxies, normal stars, dying stars, and stars being born. I received my PhD in astronomy at the University of Virginia in 1994. While there, I helped teach introductory astronomy classes and for three years (six semesters) I ran a nighttime lab where students used binoculars and telescopes to observe the sky. I wrote several of the exercises for that lab, which helped me learn how to communicate difficult astronomical techniques to people unfamiliar with the jargon. UVa also has an observatory located a few kilometers away from campus, and twice a year would hold Public Nights so people could come and look through the telescopes. I usually volunteered to stay outside the dome and answer questions people had about astronomy. The bug to teach basic astronomy to the public got a hold of me during those nights. Before that, I was (and still am) an avid amateur. I had a 10" reflecting telescope for over 20 years (I bought it when I was 13 years old), and while I was at Sonoma State I had access to a 14" and another 10". Thanks to a very generous fan, I now own a 12.5" Dobsonian telescope, which gives me fantastic views of the night sky. Recently I have become more interested in the history of science, including how science has been misused and misrepresented. As television and movies have become better and better at shaping our views of the world, it is becoming more and more important that we understand what it means to be scientific. Like it or not, those that understand science and technology will always have the advantage over those that don't. If everyone had even a basic grasp of scientific principles, this planet would be a better place. 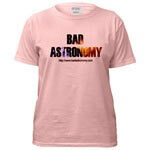 Finally, am I really a bad astronomer? I don't think so! I would say I am an average one. But on these web pages, I'm discussing astronomy that is bad. Hence the name.